The Cinque Terre excursion by minivan operates on Mondays, Wednesdays, and Saturdays from April to October. Departure time is between 7.45 and 8 am depending on your pick-up time. Avoid the peak summer months when Cinque Terre National Park can be very busy and hot. We are comparing Cinque Terre Small Group Tour by Minivan from Pisa Prices from leading ticket suppliers and Try to find you Cheap tickets prices on the market. This magical stretch of the Italian Riviera has been a protected area since 1999 when the Cinque Terre (Five Lands) National Park was founded. Made up of 5 former fishing villages, perched between high cliff faces and lapped by waves on golden beaches, the National Park is undoubtedly an area of supreme natural beauty. With almost no road access to these charming villages you'll have the chance to escape from the busy traffic and noise of urban life. Departing bright and from your hotel in Pisa you will travel south to the farther side of the national park, La Spezia. From here you will continue your journey through the park by scenic local train or boat (weather permitting). First stop inside the park is in Riomaggiore village, known for its colourful sea-side houses. As the tour continues you'll visit the villages of Manarola, Corniglia, Vernazza, and finally Monterosso. In each village your guide will introduce you to the location and give you some recommendations, then you'll be free to roam the quaint streets, walk to the beach, jump in the sea, or enjoy a typical Mediterranean meal in a local restaurant. After visiting all ‘five lands' of this national park you'll be picked up by your driver and return to Central Pisa. This excursion is ideal for nature lovers, outdoors enthusiast anyone who wants to discover the wonders of the Cinque Terre National Park without the hassle of organising their own transport. It is also a good option for people who prefer a personal style tour with the freedom to interact with a local guide. Your Experience With Cinque Terre Small Group Tour by Minivan from Pisa? Leave behind the busy streets of Pisa and travel by luxury minivan into the heart of the Cinque Terre National Park. During the day you will be brought to breath-taking panoramic views, enticing clear water, and perfectly quaint villages. Travel between each village by boat or train and dip your toes in the gorgeous Mediterranean Sea. Learn about the region from your expert regional guide and feel free to ask for tips and recommendations. What Cinque Terre Small Group Tour by Minivan from Pisa Includes? Collection from your hotel in Pisa, Livorno, or Lucca. Expert English, Spanish, Italian, and French speaking guide. Return transport in comfortable minivan. Pick up from hotel – travel to Riomaggiori – Manarola – Corniglia – Vernazza – Monterosso – return to Pisa, Lucca or Livorno. When booking this tour through Get Your Guide you must book as a group of 3 people, therefore if you are travelling solo or in a pair you should book this tour with Viator. Travelers Reviews about Cinque Terre Small Group Tour by Minivan from Pisa? 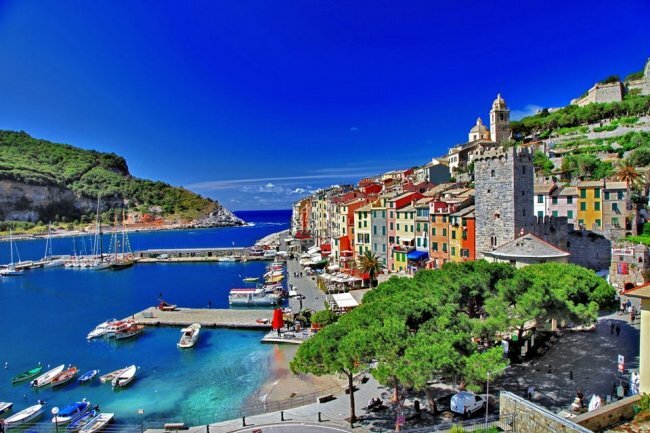 The Cinque Terre excursion by minivan is one of Viator's top tours, partnered with TripAdvisor, happy travellers have awarded a 5 out of 5-star rating. Reviews from 2017 have praised the information and friendliness shown by their tour guides and comments agree that this region of Tuscany is well worth a visit despite to length of the tour. Not suitable for wheelchair users or people with walking difficulties. Booking will be confirmed by E-mail and tickets will be accepted in printed or electronic form. For a full refund Viator requires that cancellations are made at least 7 days in advance. Get Your Guide only require 24 hours' notice. Entrance fee to the national park and foods/drinks are not included in the price of the tour. During the summer you should come prepared with a sunhat, drinking water, sunscreen etc. During the winter you should bring a rain jacket. Please wear sensible walking shoes. A minimum number of participants applies; 3 people for bookings made with Get Your Guide and 4 people for Viator. The tour may be cancelled and tickets refunded if there are not enough participants. Collection from your hotel in Pisa, or from Lucca/Livorno (Get Your Guide customers only). Contact your tour provider to arrange pick-up details.